Incidence of adrenal involvement from renal cell carcinoma is 1-2% (70). Candidates for nephron-sparing surgery for an upper pole tumor may present with contiguous involvement of the adrenal gland (pT3a tumor) or hematogenous involvement of the gland (Mi tumors) (71). In such cases, partial or radical nephrectomy with concomitant adrenalectomy is indicated. Ramani et al. (72) reported concomitant ipsilateral adrenalectomy during laparoscopic partial nephrectomy in four patients with an upper pole renal tumor and suspected adrenal involvement. Preoperative three-dimensional computed tomograpgy scan revealed renal tumor abutting the adrenal gland in three patients, and a 4-cm adrenal mass in one patient. Using a transperitoneal approach, en bloc adrenalectomy was performed first, followed by laparoscopic partial nephrectomy. The adrenal gland was maintained en bloc with the partial nephrectomy specimen. No intraoperative complication occurred, and open conversion was not necessary in any patient. Urinary leak occurred in one patient. One (25%) renal tumor was confirmed renal cancer case on pathology, while all adrenals (three normal adrenal glands and one adenoma) were free from malignant involvement. 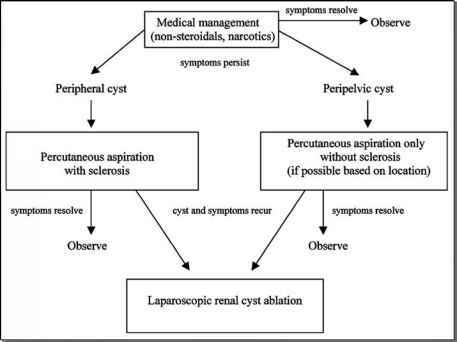 The authors highlighted some caveats, including adrena-lectomy before laparoscopic partial nephrectomy to respect oncologic principles, no dissection between the adrenal and the renal upper pole to prevent tumor spillage and lymphatic violation, prevention of excessive manipulation of the reconstructed kidney to maintain renal parenchymal hemostasis, and limitation of warm ischemia to laparoscopic partial nephrectomy only.